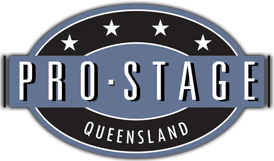 Pro-Stage Queensland is here to service the production needs for your festival, product launch, play, musical, film, exhibition, fashion parade and more! Our range of products and services include staging, seating, drapes, production and site management. Click on any of the page links on the left, or continue to read on.